The Korean language (South Korean: 한국어/韓國語 Hangugeo; North Korean: 조선말/朝鮮말 Chosŏnmal) is an East Asian language spoken by about 77 million people. It is a member of the Koreanic language family and is the official and national language of both Koreas: North Korea and South Korea, with different standardized official forms used in each country. It is also one of the two official languages in the Yanbian Korean Autonomous Prefecture and Changbai Korean Autonomous County of Jilin province, China. It is also spoken in parts of Sakhalin, Ukraine and Central Asia. Historical and modern linguists classify Korean as a language isolate; however, it does have a few extinct relatives, which together with Korean itself and the Jeju language (spoken in the Jeju Province and considered somewhat distinct) form the Koreanic language family. The linguistic homeland of Korean is suggested to be somewhere in Manchuria. Modern Korean descends from Middle Korean, which in turn descends from Old Korean (Sillan language), which descends from the Proto-Koreanic language, whose nature is debated, in part because Korean genetic origins are controversial (See Koreans for archaeological and genetic studies of the Koreans). Chinese characters arrived in Korea (See Sino-Xenic pronunciations for further information) together with Buddhism during the Proto-Three Kingdoms era in the 1st century BC. It was adapted for Korean and became known as Hanja, and remained as the main script for writing Korean through over a millennium alongside various phonetic scripts that were later invented such as Idu, Gugyeol and Hyangchal. Mainly privileged elites were educated to read and write in Hanja. However, most of the population was illiterate. In the 15th century, King Sejong the Great personally developed an alphabetic featural writing system known today as Hangul. He felt that Hanja was inadequate to write Korean and that this was the cause of its very restricted use; Hangul was designed to either aid in reading Hanja or replace Hanja entirely. Introduced in the document "Hunminjeongeum", it was called "eonmun" (colloquial script) and quickly spread nationwide to increase literacy in Korea. Hangul was widely used by all the Korean classes but often treated as "amkeul" (script for female) and disregarded by privileged elites, whereas Hanja was regarded as "jinseo" (true text). 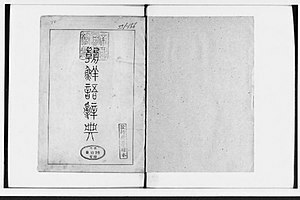 Consequently, official documents were always written in Hanja during the Joseon era. Since most people couldn't understand Hanja, Korean kings sometimes released public notices entirely written in Hangul as early as the 16th century for all Korean classes, including uneducated peasants and slaves. By the 17th century, Korean elites Yangban and their slaves exchanged Hangul letters; that indicates a high literacy rate of Hangul during the Joseon era. Today, Hanja is largely unused in everyday life due to its inconvenience, but it is still important for historical and linguistic studies. Neither South Korea or North Korea opposes the learning of Hanja, though they are not officially used in North Korea anymore, and their usage in South Korea is mainly reserved for specific circumstances, such as newspapers, scholarly papers, and disambiguation. 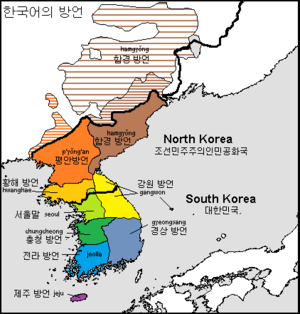 Since the Korean War, through 70 years of separation, the North–South differences have developed in standard Korean, including variations in pronunciation and vocabulary chosen, but these minor differences can be found in any of the Korean dialects and still largely mutually intelligible. The Korean names for the language are based on the names for Korea used in both North Korea and South Korea. The English word "Korean" is derived from Goryeo, which is thought to be the first Korean dynasty known to Western nations. Korean people in the former USSR refer to themselves as Koryo-saram and/or Koryo-in (literally, "Koryo/Goryeo person(s)"), and call the language Koryo-mal. In North Korea and China, the language is most often called Joseon-mal, or more formally, Joseon-o. This is taken from the North Korean name for Korea (Joseon), a name retained from the Joseon dynasty until the proclamation of the Korean Empire, which in turn was annexed by the Empire of Japan. In South Korea, the Korean language is referred to by many names including hanguk-eo ("Korean language"), hanguk-mal ("Korean speech") and uri-mal ("our language"). In "hanguk-eo" and "hanguk-mal", the first part of the word, "hanguk" was taken from the name of the Korean Empire (대한제국; 大韓帝國; Daehan Jeguk). The "Han" (韓) in Hanguk and Daehan Jeguk is derived from Samhan, in reference to the Three Kingdoms of Korea (not the ancient confederacies in the southern Korean Peninsula), while "-eo" and "-mal" mean "language" and "speech", respectively. Korean is also simply referred to as guk-eo, literally "national language". This name is based on the same Han characters, meaning "nation" + "language" ("國語"), that are also used in Taiwan and Japan to refer to their respective national languages. In mainland China, following the establishment of diplomatic relations with South Korea in 1992, the term Cháoxiǎnyǔ or the short form Cháoyǔ has normally been used to refer to the standard language of North Korea and Yanbian, whereas Hánguóyǔ or the short form Hányǔ is used to refer to the standard language of South Korea. Some older English sources also use the spelling "Corea" to refer to the nation, and its inflected form for the language, culture and people, "Korea" becoming more popular in the late 1800s according to Google's NGram English corpus of 2015. Korean is considered by most linguists to be a language isolate, though it is commonly included by proponents of the now generally rejected Altaic family. Alexander Vovin (2015) notes that Koreanic shares some typological features with the four Paleosiberian language families (e.g. lack of phonemic voiced stops, verb compounding, earlier ergativity), and suggests that it actually has more in common with "Paleosiberian" (which is a geographical and areal grouping rather a genetic one) than with the putative Altaic group. Another lesser-known theory is the Dravido-Korean languages theory which suggests a southern relation. Korean and Dravidian languages share similar vocabulary, both languages are agglutinative, follow the SOV order, nominal and adjectives follow the same syntax, particles are post positional, modifiers always precede modified words are some of the common features. However, typological similarities such as these could have arisen by chance. The Khitan language has many similar Korean vocabulary that are not found in Mongolian or Tungusic languages. This suggests a strong Korean presence or influence on Khitan. As no theory has gained wide acceptance Korean is either classificated as language isolate or as member of the Koreanic languages which in turn form a language family consisting of the Koguryoic-branch and the Han-branch. Modern Korean belongs, like Sillan, to the Han-branch. Korean is spoken by the Korean people in North Korea and South Korea and by the Korean diaspora in many countries including the People's Republic of China, the United States, Japan, and Russia. Currently, Korean is the fourth most popular foreign language in China, following English, Japanese, and Russian. Korean-speaking minorities exist in these states, but because of cultural assimilation into host countries, not all ethnic Koreans may speak it with native fluency. Street signs in Korean and English; Daegu, South Korea. Korean is the official language of North Korea and South Korea. It is also one of the two official languages of the Yanbian Korean Autonomous Prefecture in China. In North Korea, the regulatory body is the Language Institute of the Academy of Social Sciences (사회과학원 어학연구소; 社會科學院語學研究所, Sahui Gwahagweon Eohag Yeonguso). In South Korea, the regulatory body for Korean is the Seoul-based National Institute of the Korean Language, which was created by presidential decree on January 23, 1991.
the need for general support for overseas Korean language education based on a successful domestic language education program. The Topik Korea Institute is a lifelong educational center affiliated with a variety of Korean universities in Seoul, South Korea, whose aim is to promote Korean language and culture, support local Korean teaching internationally, and facilitate cultural exchanges. The institute is sometimes compared to language and culture promotion organizations such as the King Sejong Institute. Unlike that organization, however, Topik Korea Institutes operate within established universities and colleges around the world, providing educational materials. Korean has numerous small local dialects (called mal (말) [literally "speech"], saturi (사투리), or bang'eon (방언 in Korean). The standard language (pyojun-eo or pyojun-mal) of both South Korea and North Korea is based on the dialect of the area around Seoul (which, as Hanyang, was the capital of Joseon-era Korea for 500 years), though the northern standard after the Korean War has been influenced by the dialect of P'yŏngyang. 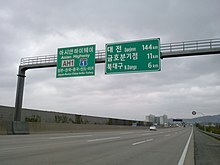 All dialects of Korean are similar to each other and largely mutually intelligible (with the exception of dialect-specific phrases or non-Standard vocabulary unique to dialects), though the dialect of Jeju Island is divergent enough to be sometimes classified as a separate language. One of the more salient differences between dialects is the use of tone: speakers of the Seoul dialect make use of vowel length, whereas speakers of the Gyeongsang dialect maintain the pitch accent of Middle Korean. Some dialects are conservative, maintaining Middle Korean sounds (such as z, β, ə) which have been lost from the standard language, whereas others are highly innovative. There is substantial evidence for a history of extensive dialect levelling, or even convergent evolution or intermixture of two or more originally distinct linguistic stocks, within the Korean language and its dialects. Many Korean dialects have basic vocabulary that is etymologically distinct from vocabulary of identical meaning in Standard Korean or other dialects, for example "garlic chives" translated into Gyeongsang dialect /t͡ɕʌŋ.ɡu.d͡ʑi/ (정구지) but in Standard Korean, it is /puːt͡ɕʰu/ (부추). This suggests that the Korean Peninsula may have at one time been much more linguistically diverse than it is at present. See also the Japanese–Koguryoic languages hypothesis. Nonetheless, the separation of the two Korean states has resulted in increasing differences among the dialects that have emerged over time. Since the allies of the newly founded nations split the Korean peninsula in half after 1945, the newly formed Korean nations have since borrowed vocabulary extensively from their respective allies. As the Soviet Union helped industrialize North Korea and establish it as a communist state, the North Koreans therefore borrowed a number of Russian terms. Likewise, since the United States helped South Korea extensively to develop militarily, economically, and politically, South Koreans therefore borrowed extensively from English. The differences among northern and southern dialects have become so significant that many North Korean defectors reportedly have had great difficulty communicating with South Koreans after having initially settled into South Korea. In response to the diverging vocabularies, an app called Univoca was designed to help North Korean defectors learn South Korean terms by translating them into North Korean ones. More info can be found on the page North-South differences in the Korean language. Aside from the standard language, there are few clear boundaries between Korean dialects, and they are typically partially grouped according to the regions of Korea. Seoul (표준말) Standard language of ROK. Seoul; very similar to Incheon and most of Gyeonggi, west of Gangwon-do (Yeongseo region); also commonly used among younger Koreans nationwide and in online context. Munhwaŏ (문화어) Standard language of DPRK. Based on P'yŏngan dialect. 1 The semivowels /w/ and /j/ are represented in Korean writing by modifications to vowel symbols (see below). Hangul spelling does not reflect these assimilatory pronunciation rules, but rather maintains the underlying, partly historical morphology. Given this, it is sometimes hard to tell which actual phonemes are present in a certain word. Korean is an agglutinative language. The Korean language is traditionally considered to have nine parts of speech. For details, see Korean parts of speech. Modifiers generally precede the modified words, and in the case of verb modifiers, can be serially appended. The basic form of a Korean sentence is subject–object–verb, but the verb is the only required and immovable element and word order is highly flexible, as in many other agglutinative languages. The relationship between a speaker or writer and his or her subject and audience is paramount in Korean grammar. The relationship between speaker/writer and subject referent is reflected in honorifics, whereas that between speaker/writer and audience is reflected in speech level. When talking about someone superior in status, a speaker or writer usually uses special nouns or verb endings to indicate the subject's superiority. Generally, someone is superior in status if he/she is an older relative, a stranger of roughly equal or greater age, or an employer, teacher, customer, or the like. Someone is equal or inferior in status if he/she is a younger stranger, student, employee, or the like. Nowadays, there are special endings which can be used on declarative, interrogative, and imperative sentences; and both honorific or normal sentences. Honorifics in traditional Korea were strictly hierarchical. The caste and estate systems possessed patterns and usages much more complex and stratified than those used today. The intricate structure of the Korean honorific system flourished in traditional culture and society. Honorifics in contemporary Korea are now used for people who are psychologically distant. Honorifics are also used for people who are superior in status. For example, older people, teachers, and employers. The three levels with high politeness (very formally polite, formally polite, casually polite) are generally grouped together as jondaenmal (존댓말), whereas the two levels with low politeness (formally impolite, casually impolite) are banmal (반말) in Korean. The remaining two levels (neutral formality with neutral politeness, high formality with neutral politeness) are neither polite nor impolite. In general, Korean lacks grammatical gender. As one of the few exceptions, the third-person singular pronoun has two different forms: 그 geu (male) and 그녀 geunyeo (female). Before 그녀 were invented in need of translating 'she' into Korean, 그 was the only one third-person singular pronoun, and had no grammatical gender. However, one can still find stronger contrasts between the sexes within Korean speech. Some examples of this can be seen in: (1) softer tone used by women in speech; (2) a married woman introducing herself as someone’s mother or wife, not with her own name; (3) the presence of gender differences in titles and occupational terms (for example, a sajang is a company president and yŏsajang is a female company president. ); (4) females sometimes using more tag questions and rising tones in statements, also seen in speech from children. Between two people of asymmetrical status in a Korean society, people tend to emphasize differences in status for the sake of solidarity. Koreans prefer to use kinship terms, rather than any other terms of reference. In traditional Korean society, women have long been in disadvantaged positions. Korean social structure traditionally was a patriarchically dominated family system that emphasized the maintenance of family lines. This structure has tended to separate the roles of women from those of men. The exact proportion of Sino-Korean vocabulary is a matter of debate. Sohn (2001) stated 50–60%. Later, the same author (2006, p. 5) gives an even higher estimate of 65%. Jeong Jae-do, one of the compilers of the dictionary Urimal Keun Sajeon, asserts that the proportion is not so high. He points out that Korean dictionaries compiled during the colonial period include many unused Sino-Korean words. In his estimation, the proportion of Sino-Korean vocabulary in the Korean language might be as low as 30%. Most of the vocabulary consists of two sets of words; native Korean and Sino Korean respectively. It is similar to that of English — native English words and Latinate equivalents such as water-aqua, fire-flame, sea-marine, two-dual, sun-solar, star-stellar. Therefore just like other Korean words, Korean has two sets of numeral systems. However, unlike English and Latin which belong to the same Indo-European languages family and bear a certain resemblance, Korean and Chinese are genetically unrelated and the two sets of words differ completely. All Sino Korean morphemes are monosyllabic as in Chinese, whereas native Korean morphemes can be polysyllabic. The Sino Korean words were deliberately imported along with corresponding Chinese characters for a written language and everything was supposed to be written in Hanja, so the coexistence of Sino Korean would be more thorough and systematic than that of Latinate words in English. To a much lesser extent, some words have also been borrowed from Mongolian and other languages. The vast majority of loanwords other than Sino-Korean come from modern times, approximately 90% of which are from English. Many words have also been borrowed from Western languages such as German via Japanese (아르바이트 (areubaiteu) "part-time job", 알레르기 (allereugi) "allergy", 기브스 (gibseu or gibuseu) "plaster cast used for broken bones"). Some Western words were borrowed indirectly via Japanese during the Japanese occupation of Korea, taking a Japanese sound pattern, for example "dozen" > ダース dāsu > 다스 daseu. Most indirect Western borrowings are now written according to current "Hangulization" rules for the respective Western language, as if borrowed directly. There are a few more complicated borrowings such as "German(y)" (see names of Germany), the first part of whose endonym Deutschland [ˈdɔʏ̯t͡ʃ.lant] the Japanese approximated using the kanji 獨逸 doitsu that were then accepted into the Korean language by their Sino-Korean pronunciation: 獨 dok + 逸 il = Dogil. In South Korean official use, a number of other Sino-Korean country names have been replaced with phonetically oriented "Hangeulizations" of the countries' endonyms or English names. Because of such a prevalence of English in modern South Korean culture and society, lexical borrowing is inevitable. English-derived Korean, or 'Konglish' (콩글리쉬), is increasingly used. The vocabulary of the South Korean dialect of the Korean language is roughly 5% loanwords (excluding Sino-Korean vocabulary). However, due to North Korea's isolation, such influence is lacking in North Korean speech. Korean uses words adapted from English in ways that may seem strange to native English speakers. For example, fighting (화이팅 / 파이팅) is a term of encouragement like 'come on'/'go (on)' in English. Something that is 'service' (서비스) is free or 'on the house'. A building referred to as an 'aparteu' (아파트) is an 'apartment' (but in fact refers to a residence more akin to a condominium) and a type of pencil that is called a 'sharp' (샤프) is a mechanical pencil. Like other borrowings, many of these idiosyncrasies, including all the examples listed above, appear to be imported into Korean via Japanese, or influenced by Japanese. Many English words introduced via Japanese pronunciation have been reformed as in 멜론 (melon) which was once called 메론 (meron) as in Japanese. Before the creation of the modern Korean alphabet, known as Chosŏn'gŭl in North Korea and as Hangul in South Korea, people in Korea (known as Joseon at the time) primarily wrote using Classical Chinese alongside native phonetic writing systems that predate Hangul by hundreds of years, including idu, hyangchal, gugyeol, and gakpil. However, due to the fundamental differences between the Korean and Chinese languages and the large number of characters to be learned, the lower classes, who often didn't have the privilege of education, had much difficulty in learning how to write using Chinese characters. To assuage this problem, King Sejong (r. 1418–1450) created the unique alphabet known as Hangul to promote literacy among the common people. The Korean alphabet was denounced and looked down upon by the yangban aristocracy, who deemed it too easy to learn, but it gained widespread use among the common class, and was widely used to print popular novels which were enjoyed by the common class. With growing Korean nationalism in the 19th century, the Gabo Reformists' push, and the promotion of Hangul in schools, in 1894, Hangul displaced Hanja as Korea's national script. Hanja are still used to a certain extent in South Korea, where they are sometimes combined with Hangul, but this method is slowly declining in use, even though students learn Hanja in school. The letters of the Korean alphabet are not written linearly like most alphabets, but instead arranged into blocks that represent syllables. So, while the word bibimbap is written as eight characters in a row in English, in Korean it is written 비빔밥, as three syllable blocks in a row. The syllable blocks are then written left to right, top to bottom. Modern Korean is written with spaces between words, a feature not found in Chinese or Japanese (except when Japanese is written exclusively in hiragana, as in children's books). Korean punctuation marks are almost identical to Western ones. Traditionally, Korean was written in columns, from top to bottom, right to left, but it is now usually written in rows, from left to right, top to bottom. Words that are written the same way may be pronounced differently, such as the examples below. The pronunciations below are given in Revised Romanization, McCune–Reischauer and Hangul, the last of which represents what the Hangul would be if one were to write the word as pronounced. 한나산 한라산 Hallasan hallasan (hallasan) When a ㄴㄴ combination is pronounced as ll, the original Hangul spelling is kept in the North, whereas the Hangul is changed in the South. 할가요 halgayo (halkayo) 할까요 halkkayo (halkkayo) Shall we do? Although the Hangul differ, the pronunciations are the same (i.e. with the tensed ㄲ sound). 조선말 joseonmal (chosŏnmal) 한국말 han-guk'mal (han-guk'mal) Korean language The Korean language was used throughout the Korea and Manchuria as a reference, but as the South decided to name the nation the Republic of Korea, the Korean language gradually settled down in the south and its ideology before and after liberation was quickly settled. Such changes were made after the Korean War and the ideological battle between the anti-Communist government in the South and North Korea's communism. In the North, guillemets 《 and 》 are the symbols used for quotes; in the South, quotation marks equivalent to the English ones, " and ", are standard, although 『 』 and 「 」 are also used. For native English speakers, Korean is generally considered to be one of the most difficult languages to master despite the relative ease of learning Hangul. For instance, the United States' Defense Language Institute places Korean in Category IV, which also includes Japanese, Chinese (e.g. Mandarin, Cantonese & Shanghainese) and Arabic. This means that 63 weeks of instruction (as compared to just 25 weeks for Italian, French, Portuguese and Spanish) are required to bring an English-speaking student to a limited working level of proficiency in which he or she has "sufficient capability to meet routine social demands and limited job requirements" and "can deal with concrete topics in past, present, and future tense." Similarly, the Foreign Service Institute's School of Language Studies places Korean in Category IV, the highest level of difficulty. The study of the Korean language in the United States is dominated by Korean American heritage language students; in 2007 they were estimated to form over 80% of all students of the language at non-military universities. However, Sejong Institutes in the United States have noted a sharp rise in the number of people of other ethnic backgrounds studying Korean between 2009 and 2011; they attribute this to rising popularity of South Korean music and television shows. In 2018 it was reported that the rise in K-Pop was responsible for the increase in people learning the language in US universities. There are two widely used tests of Korean as a foreign language: the Korean Language Proficiency Test (KLPT) and the Test of Proficiency in Korean (TOPIK). The Korean Language Proficiency Test, an examination aimed at assessing non-native speakers' competence in Korean, was instituted in 1997; 17,000 people applied for the 2005 sitting of the examination. The TOPIK was first administered in 1997 and was taken by 2,274 people. Since then the total number of people who have taken the TOPIK has surpassed 1 million, with more than 150,000 candidates taking the test in 2012. TOPIK is administered in 45 regions within South Korea and 72 nations outside of South Korea, with a significant portion being administered in Japan and North America, which would suggest the targeted audience for TOPIK is still primarily foreigners of Korean heritage. This is also evident in TOPIK's website, where the examination is introduced as intended for Korean heritage students. ^ Hammarström, Harald; Forkel, Robert; Haspelmath, Martin, eds. (2017). "Korean". Glottolog 3.0. Jena, Germany: Max Planck Institute for the Science of Human History. ^ Hölzl, Andreas (2018-08-29). A typology of questions in Northeast Asia and beyond: An ecological perspective. Language Science Press. ISBN 9783961101023. ^ "Державна служба статистики України". www.ukrstat.gov.ua. Retrieved 2019-04-14. ^ Song, Jae Jung (2005), The Korean language: structure, use and context, Routledge, p. 15, ISBN 978-0-415-32802-9 . ^ Campbell, Lyle; Mixco, Mauricio (2007), "Korean, A language isolate", A Glossary of Historical Linguistics, University of Utah Press, pp. 7, 90–91, most specialists... no longer believe that the... Altaic groups... are related […] Korean is often said to belong with the Altaic hypothesis, often also with Japanese, though this is not widely supported . ^ Dalby, David (1999–2000), The Register of the World's Languages and Speech Communities, Linguasphere Press . ^ Kim, Nam-Kil (1992), "Korean", International Encyclopedia of Linguistics, 2, pp. 282–86, scholars have tried to establish genetic relationships between Korean and other languages and major language families, but with little success . ^ Róna-Tas, András (1998), "The Reconstruction of Proto-Turkic and the Genetic Question", The Turkic Languages, Routledge, pp. 67–80, [Ramstedt's comparisons of Korean and Altaic] have been heavily criticised in more recent studies, though the idea of a genetic relationship has not been totally abandoned . ^ Schönig, Claus (2003), "Turko-Mongolic Relations", The Mongolic Languages, Routledge, pp. 403–19, the 'Altaic' languages do not seem to share a common basic vocabulary of the type normally present in cases of genetic relationship . ^ Kim-Renaud, Young-Key (1997). The Korean Alphabet: Its History and Structure. University of Hawaii Press. p. 15. ISBN 9780824817237. Retrieved 16 May 2018. ^ Vovin, Alexander (2015). "Korean as a Paleosiberian Language". 알타이할시리즈 2. ISBN 978-8-955-56053-4. Retrieved 2016-11-06. ^ Starostin, Sergei (1991). Altaiskaya problema i proishozhdeniye yaponskogo yazika [The Altaic Problem and the Origins of the Japanese Language] (PDF). Moscow: Nauka. ^ "The Korean Language". Cambridge University Press. P. 29. Min-Sohn, Ho (2001). The Korean Language. Cambridge University Press. p. 29. ^ Janhunen, Juha (2005). "The Lost Languages of Koguryo". Journal of Inner and East Asian Studies. 2–2: 65–86. ^ Sohn, Ho-Mi (2001-03-29). The Korean Language. ISBN 9780521369435. ^ "Korean is virtually two languages, and that's a big problem for North Korean defectors". Public Radio International. Retrieved 2016-01-18. ^ a b c d Sohn, Ho-Min (2006). Korean Language in Culture and Society. Boston: Twayne Publishers. ISBN 978-0-8248-2694-9. ^ Choo, Miho (2008). Using Korean: A Guide to Contemporary Usage. Cambridge University Press. p. 3. ISBN 978-1-139-47139-8. ^ Cho, Young A. Gender Differences in Korean Speech. Korean Language in Culture and Society. Ed. Ho-min Sohn. University of Hawaii Press, 2006. pp. 189–98. ^ Kim, Minju. "Cross Adoption of language between different genders: The case of the Korean kinship terms hyeng and enni." Proceedings of the Fifth Berkeley Women and Language Conference. Berkeley: Berkeley Women and Language Group. 1999. ^ Palley, Marian Lief. "Women’s Status in South Korea: Tradition and Change." Asian Survey, Vol 30 No. 12. December 1990. pp. 1136–53. ^ Kim, Jin-su (2009-09-11). 우리말 70%가 한자말? 일제가 왜곡한 거라네 [Our language is 70% hanja? Japanese Empire distortion]. The Hankyoreh. Retrieved 2009-09-11. . The dictionary mentioned is 우리말 큰 사전. Seoul: Hangul Hakhoe. 1992. OCLC 27072560. ^ Hannas, Wm C. (1997). Asia's Orthographic Dilemma. University of Hawaii Press. p. 57. ISBN 978-0-8248-1892-0. Retrieved 20 September 2016. ^ Chen, Jiangping (2016-01-18). Multilingual Access and Services for Digital Collections. ABC-CLIO. p. 66. ISBN 978-1-4408-3955-9. Retrieved 20 September 2016. ^ Koerner, E. F. K.; Asher, R. E. (2014-06-28). Concise History of the Language Sciences: From the Sumerians to the Cognitivists. Elsevier. p. 54. ISBN 978-1-4832-9754-5. Retrieved 13 October 2016. ^ Montgomery, Charles (19 January 2016). "Korean Literature in Translation – CHAPTER FOUR: IT ALL CHANGES! THE CREATION OF HANGUL". www.ktlit.com. KTLit. Retrieved 2016-04-20. Hangul was sometimes known as the "language of the inner rooms," (a dismissive term used partly by yangban in an effort to marginalize the alphabet), or the domain of women. ^ Chan, Tak-hung Leo (2003). One Into Many: Translation and the Dissemination of Classical Chinese Literature. Rodopi. p. 183. ISBN 978-9042008151. Retrieved 26 December 2016. ^ "Korea News Review". Korea Herald, Incorporated. 1 January 1994. Retrieved 26 December 2016. ^ Lee, Kenneth B. (1997). Korea and East Asia: The Story of a Phoenix. Greenwood Publishing Group. p. 90. ISBN 978-0-275-95823-7. Retrieved 26 December 2016. ^ Silva, David J. (2008). "Missionary Contributions toward the Revaluation of Han'geul in Late 19th Century Korea" (PDF). International Journal of the Sociology of Language. 192 (192): 57–74. CiteSeerX 10.1.1.527.8160. doi:10.1515/ijsl.2008.035. ^ "Korean History". Korea.assembly.go.kr. Retrieved 2016-04-26. Korean Empire, Edict No. 1 – All official documents are to be written in Hangul, and not Chinese characters. ^ "현판 글씨들이 한글이 아니라 한자인 이유는?". royalpalace.go.kr (in Korean). Archived from the original on 2017-03-10. Retrieved 2016-04-26. ^ Choe, Sang-hun (2006-08-30). "Koreas: Divided by a common language". Retrieved 2012-08-16. ^ "Beliefs that bind". Korea JoongAng Daily. 2007-10-23. Archived from the original on 2013-05-01. Retrieved 2012-08-16. ^ Raugh, Harold E. "The Origins of the Transformation of the Defense Language Program" (PDF). Applied Language Learning. 16 (2): 1–12. Archived from the original (PDF) on June 30, 2007. Retrieved 2008-01-09. ^ "Languages". United States Department of State. Retrieved 2016-05-27. ^ Lee, Saekyun H.; HyunJoo Han. "Issues of Validity of SAT Subject Test Korea with Listening" (PDF). Applied Language Learning. 17 (1): 33–56. Archived from the original (PDF) on 2008-06-25. ^ Pickles, Matt (2018-07-11). "K-pop drives boom in Korean language lessons". BBC News. Retrieved 2018-07-12. ^ "Korea Marks 558th Hangul Day". The Chosun Ilbo. 2004-10-10. Archived from the original on 2008-02-19. Retrieved 2008-01-09. ^ "Korean language test-takers pass 1 mil". The Korea Times. Retrieved 25 January 2013. ^ "TOPIK 한국어능력시험". www.topik.go.kr (in Korean). Retrieved 2017-10-24. Chang, Suk-jin (1996). Korean. Philadelphia: John Benjamins Publishing Company. ISBN 978-1-55619-728-4. (Volume 4 of the London Oriental and African Language Library). Martin, Samuel E. (2006). A Reference Grammar of Korean: A Complete Guide to the Grammar and History of the Korean Language – 韓國語文法總監. Tuttle Publishing. ISBN 978-0-8048-3771-2. Rybatzki, Volker (2003). Middle Mongol. In: Juha Janhunen (ed.) (2003): The Mongolic languages. London: Routledge. ISBN 0-7007-1133-3, pp. 47–82.